In our physiotherapy clinic and Pilates classes, you will always hear us harp on about breathing well. This mean breathing with your diaphragm, the most important muscle of breath and for other things! We hope that you get the gist and realise that it is something really important! So, what is the diaphragm? The diaphragm is our main breathing muscle. It is a dome shaped muscle that sits at the base of your lungs. Imagine it being like a parachute, which moves down from your ribcage and into your abdomen as you breathe in, and back up into a dome as you breathe out. Notice how as your baby or child takes a breath in, the belly rises and lower ribcage expands out to each sides, and then falls back in when breathing out. This is true diaphragmatic breathing. Can you believe that we are all born breathing this way, but as we get older and deal with everyday stressors such as traffic, work and constantly being ‘on the go’, this changes for the worst? 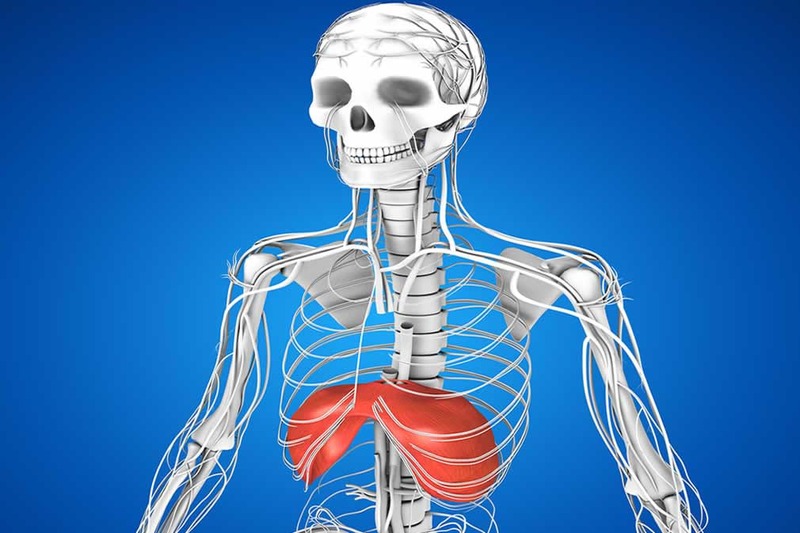 We tend to start to breathe more through our chest than diaphragm. Not only is this a less efficient way of breathing and taking in oxygen, but it’s also not doing our backs and necks any favours either! How is this so? Why is the diaphragm so important in Pilates or in posture generally? It is an integral part of your postural support system for the trunk. The diaphragm and breathing well is the start of good ‘core’ or postural control. Have you noticed how your body tenses up during a more difficult exercise, only to then realise that you were either holding your breath or taking shallow breaths? This is why for each Pilates exercise, there is always a breath in or out to accompany that movement. Your diaphragm is connected to your deep abdominals and pelvic floor via connective tissue. So the more awareness you have over diaphragmatic breathing, the more control you can obtain over your deep abdominal and pelvic floor activation. This will then provide you with more stability through your back and trunk. It will make your movements more efficient. This will allow for you to challenge your strength and endurance more. A win, win result! It is an important contributor to thoracic and rib movement and flexibility. Quite simply, a breathing strategy that asks your ribs to expand will keep the upper trunk more mobile. This combats the stiffening of the upper back most of us experience with poor posture, sedentary work practices, or even lack of exercise. And, a mobile upper trunk will help alleviate the stresses through both of the neck and lower back, potentially decreasing our pains, aches and tension in these regions of our spine. Who would have thought that just breathing through the diaphragm can have such a profound effect? How can I breathe better using my diaphragm? Firstly, simply take a moment now to notice how your natural state of breathing is. Place one hand on your chest, the other on your stomach. Which one moves more? You may even find this has a calming, meditative effect on your body as well – an added bonus! If you are breathing predominantly through your chest, this is most likely a learned habit, or could also indicate there is some stiffness/restrictions of movement in your upper back or thorax. If you think you are a chest breather, try to breathe ‘deep and wide’, feeling the abdomen swell and expand and the ribs shift sideways. This would be a good start to break and chest breathing pattern and habit. Classes like Pilates and Yoga can also get you learning the diaphragmatic breath. It will one day become your natural breathing habit but this will take time. In our next fix newsletter, Julia will expand on this for more ways to incorporate diaphragmatic breathing into everyday life. Alternatively, feel free to chat to our physios at The Fix Program in the meantime. Your draft 'term 2 2018' Broadway Pilates timetable is subject to change. The Mums&bubs classes will run for 6 WEEKS (less of a commitment! ), whilst our Intermediate and Pregnancy classes will run for 10 WEEKS. These are all on in our Broadway clinic, within the Fernwood Ladies Gym. Classes will commence from Tuesday 1 May 2018. Mums&Bubs post natal Pilates. Safe and fun with baby when you really want to be sure your exercise is safe as a new mum - our MOST POPULAR classes at this clinic. Your draft 'term 2 2018' Pilates and Yoga timetable is subject to change. These classes will run for 10 WEEKS in our York St, CBD clinic. Classes will commence from Monday 30 April and end Friday 6 July 2018. We note that the Queen's birthday public holiday falls on Monday 11 June, and therefore, Monday classes will run for a 9 week term only ( this class will be removed from fees for these attendees). Beginners Pilates for those new to postural strength and awareness, or want to get back into safe and mindful exercise after a break or injury. Intermediate/advanced level Pilates for challenging and functional postural control for those having completed our Beginners program. Stay informed about relevant health issues, exercises, and the latest findings with our monthly newsletter. Delivered free to your inbox.